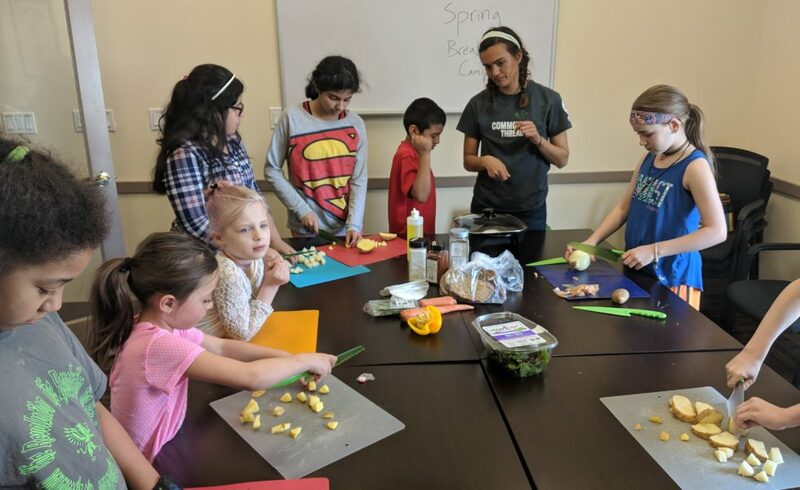 During Spring Break this year, some of our Food Educators led cooking activities at both Regency and Sterling Meadows apartment complexes. Keep reading to hear some of the highlights! Our first day at each site was “Exercise & Health Day.” We danced Zumba, stretched, and made green, nutrient-packed smoothies — and we even pickled some beets and peppers! On our second day, we received a mystery box from the Food Bank. Kids were assigned the task of creating a recipe from whatever ingredients they found in the box. The result of their creativity was a delicious potato egg skillet! On our third day we focused on insects, including learning about butterfly adaptations. We made a delicious ‘dirt’ hummus for our “insects” to enjoy. On our final day we celebrated with a homemade pizza party! We made our own crust and placed fresh toppings on the dough before baking it. Once the pizza was cooked, we enjoyed a last meal together. Each young chef was presented with a certificate in honor of their unique contribution to the week and a chef-in-training goody bag that included a skillet pan (thank you Haggen! ), spatula (thank you Peace Health! ), and a Common Threads sticker. One fourth grader was eager to make our green smoothies again! She told us that she couldn’t wait to go to the store later that day to get all the ingredients and make it with her mom! One student came back as we were packing up to thank us for the cooking classes. She said she loves to cook and has over 60 cookbooks. She said she couldn’t wait for the next class!